The whole mini-pickup boom is quickly becoming another historical era, like the Great Brougham Epoch. Pickups are of course more in than ever, but even the descendants of the mini pickups are now mighty big. So what shall we call the times when trucks like this Mazda-built Ford Courier were so rampant? The Lessor Pickup Epoch? 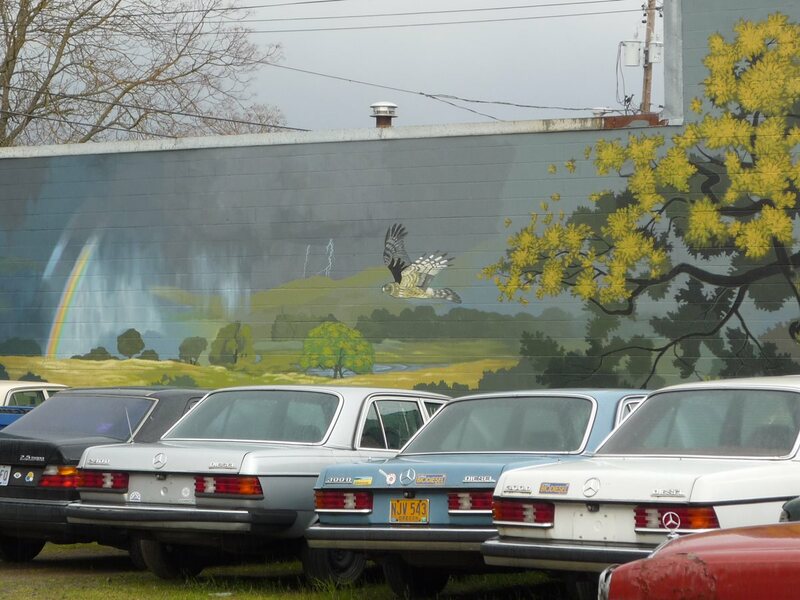 Eugene is something of a living zoo for otherwise near-extinct automotive species. Not just one, but two of these lessor pickups back to back. And there’s gobs of genuine old lesser Toyota pickups to be seen. Admittedly, that’s not the case with the Courier, which is why I shot it. They are endangered, and need to be listed and protected. You might as well be looking at the automotive interior equivalent of the Permian Age here compared to a modern pickup. 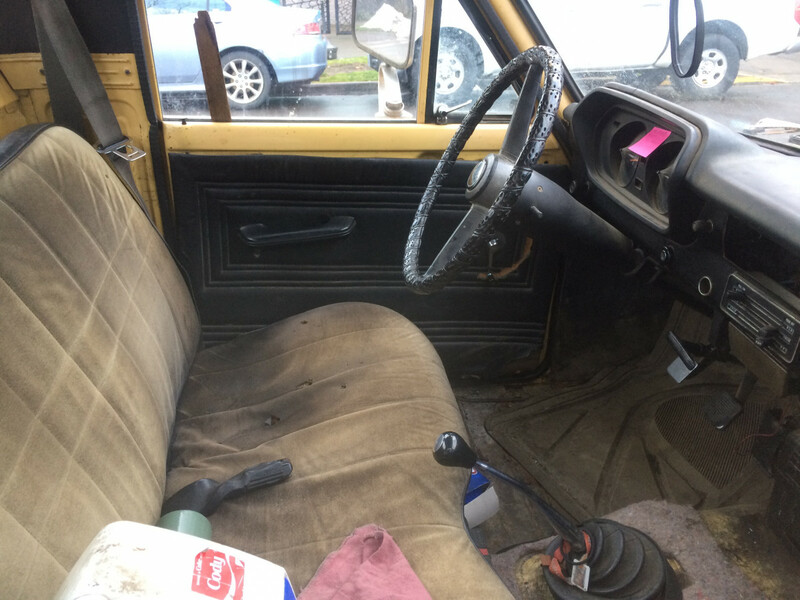 A bench seat and a stick shift? And almost nothing else, except for that very utilitarian Mazda steering wheel. Which actually steered the wheels directly and mechanically, if you can believe it. The earlier Couriers (above, and written up in a full CC here) used Mazda’s old SOHC four, in 1.8 form, that dated back to the original Luce of 1966. 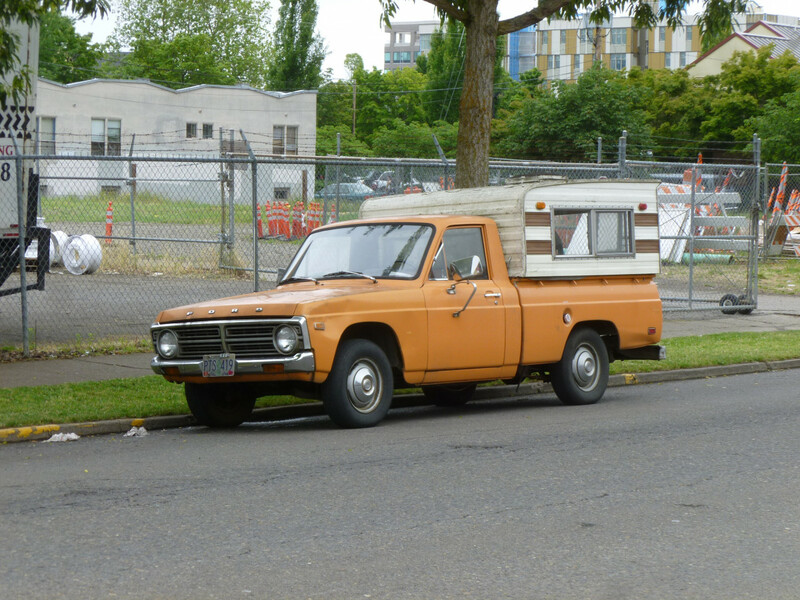 The gen2 Courier, which arrived in 1977, got a 2.0L version. But closer to the end of the Courier’s life, the “Pinto” 2.3 four replaced it. How did they do that? Ship the engines from Lima, OH to Japan, to be installed and then be shipped back to the US, where it also got its bed, in order to avoid the chicken tax? Sounds complicated for such a simple little truck. Here’s the business end. And yes, these trucks were made for hauling, and not just the skis or climbing gear. The tailgate of this one makes that pretty obvious; it didn’t get this way from “tailgating” at the Oregon Ducks football games. It looks like a smaller version of my old Ford. 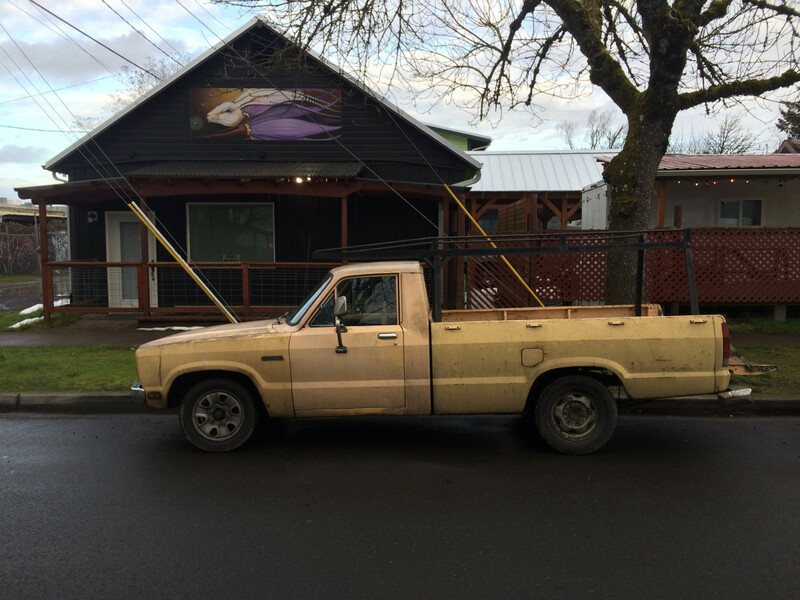 Folks in Eugene, like yours truly, still believe in using old pickups this way. What will they do 20 or 30 years from now? Keep the old ones running forever, like I’m doing? Or import used little work trucks from China? Who knows? 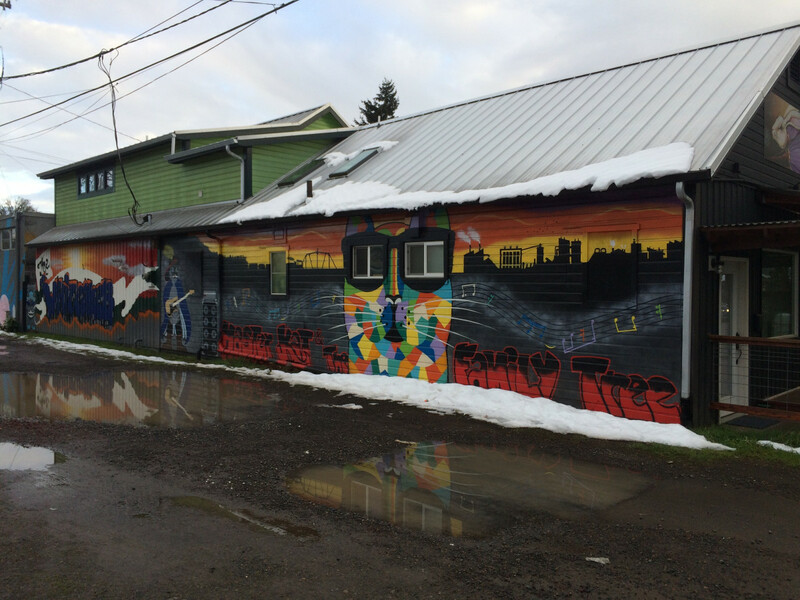 While we ponder that, here’s the side of the building the Courier was sitting in front of. It’s actually the back side of a combination vintage Mercedes (think diesel, not SL’s) shop and living space for the proprietor and his family, up there in the back. I took a shot of the storage lot on the other side some years back, during the peak of the Great Biodiesel Epoch, another era consigned to history. What will be next? The Great Sedan Extinction? 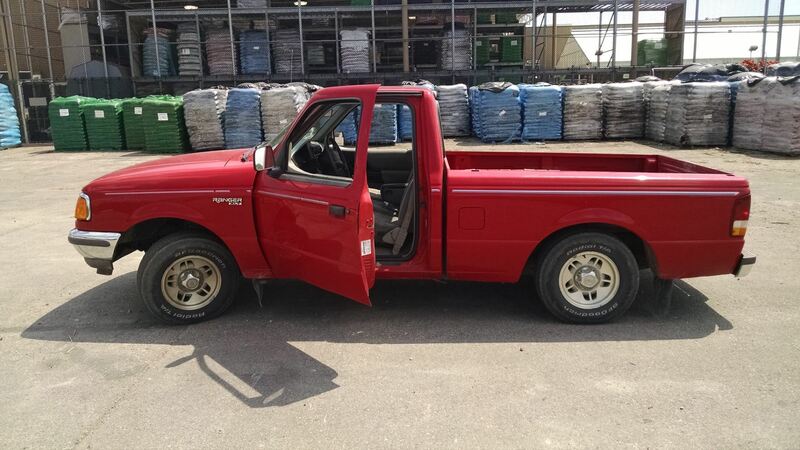 While I’ve never owned a compact pickup, Dad had a ’95 Ford Ranger. It was pretty forgettable as vehicles go, though – shocks were shot and it wasn’t pleasant at all to drive. The old Courier and LUV appeal to me, though, if only for their simplicity. Call it the “best” period in design. As alluded too in the opening paragraph, the current crop of “small” pickups have morphed in size and complexity. Long live the period of the SIMPLE mini pickup!!!! I always had a thing for these Couriers. This was one of the most attractively styled vehicles to come out of the Ford Motor Company in the 1970s. And I completely agree about giving small pickups their own epoch. If my Lincoln-loving father buying a new Datsun 4×4 King Cab in 1981 (in red, no less) was not an indicator that an epoch was upon us, I do not know what else would have been. I love me an old functional pickup. In the Midwest all of those early ones have rotted away long ago, and Japanese ones (captive or not) were probably much rarer to begin with. The #1 stalwart seems to be the Ford Rangers, although there are plenty of the mid 90s+ S10s still trolling around as well. Whatever Ford used on their sheetmetal at the time, the ’93-’97 Rangers seem incredibly well protected from sheetmetal rot. Not to say impervious, but relative to the aforementioned S10s, they are MUCH better. Before I bought my second Ranger, I test drove a well preserved Mighty Max up near Columbia City. A very quirky and different experience, incredibly thin feeling doors that made the interior wider but combined with a total lack of sound deadening, the overall experience was that of riding in a tin can. Combined with the chopped springs (courtesy of the young guy who rescued the truck from a barn) and the manual steering rack, it was simply much less functional and less convenient to drive. If not for the chopped springs, I think I would have bought it just for the uniqueness. I’ve got nothing but positive things to say about my 2 Rangers, not as cool as an old Mazda or Isuzu or something given their common-as-dirt status around these parts, but that speaks to their durability. Parts are cheap as chips, yards are still full of them. The 2.3L Lima is as reliable as anything Japanese, I can confidently say you can ignore that timing belt job well past the recommended interval. Rangers are known for rotted frames in salt country. My 01’s frame broke from rot in 2012. Great truck otherwise. True that, my ’97’s frame was pretty far along, and we have a ’98ish 4wd in the parking lot at work with a droopy bumper (rotted frame). When I bought my ’94 I made a solid frame a priority. Keep it well washed and with the C-channel design it should stay strong for years! …Yeah, I should replace the timing belt on my Ranger, also. I’m thinking about fixing up and turning old Rangers in my spare time. A straight ’95 around the corner from me apparently was put up for $200. As near as I could tell, its only problem was that it sat for several years. The thought had occurred to me as well, on the one hand there is a steady demand for them, they are easy to find in fixer-upper condition and very cheap and easy to wrench on. On the other side, there is a big supply of cheap ones always for sale, so your margins would be pretty slim I think. I’d aim a bit higher and go after something like GMT400 or ’92-96 F150s. People will pay a pretty penny for one that’s not rotted out and has solid mechanicals, even with high miles. Get good with patching sheetmetal and painting (or hauling clean southern trucks up and fixing mechanical issues) and you’d be in the money I think. If pickups of this size were still sold in the US I’d be sorely tempted to buy one as my emergency backup vehicle. I have all sorts of good uses for a truck but am turned off by the sheer mass of a modern full-size truck. Interesting idea, it’s just the right size for a lot of things. Not a good size for crashing, but there’s ways around that. We can import little Japanese vans if they’re over 15 years old. Haven’t seen any little trucks though. For emergency back-up duty and weekend hauling, why not just buy a perfectly serviceable older used truck? Their durability and mechanical simplicity makes the risk of expensive mechanical failures relatively low. I say this as a currently-truckless individual, but I’m in good graces of a friend by way of recently installing a fresh water pump on his ’98 K1500 Chevy so I’m borrowing that this weekend to haul gravel, gardening soil, lumber, and mulch. Trying to knock it all out in one day. First the Mazda became a Ford. Then in the late Ranger era, the Ford became the Mazda. The new Ranger and Mazda BT50 are the same vehicle with minor styling differences. The Courier badge was dropped here some years ago and the US market Ranger badge adopted. Were these the slowest minitrucks of the era? My Mazda Sundowner would barely pull a hill empty. I had to downshift to 2nd gear going up Alabama hill. Other drivers would honk at me. I stayed in the slow lane on I-5. Durable trucks, though. I sold mine several years ago, and it stuck around the area until last year. Beat to hell but still wearing the ’67 Valiant wheelcovers I put on it. The Mini truck Epoch does need a name. I have quite the appreciation of several kinds of cars (trucks, mororcycles…) but I’ve been a fan of mini trucks since I was a kid. Basic trucks. The older I get, the more basic. I’m keeping my ’93 Ranger Sport. My enthusiasm for the new Ranger has subsided some. Kinda big and too pricey. Can’t afford it on a Whatcom County hourly wage. What I’d want probably doesn’t exist anyway. 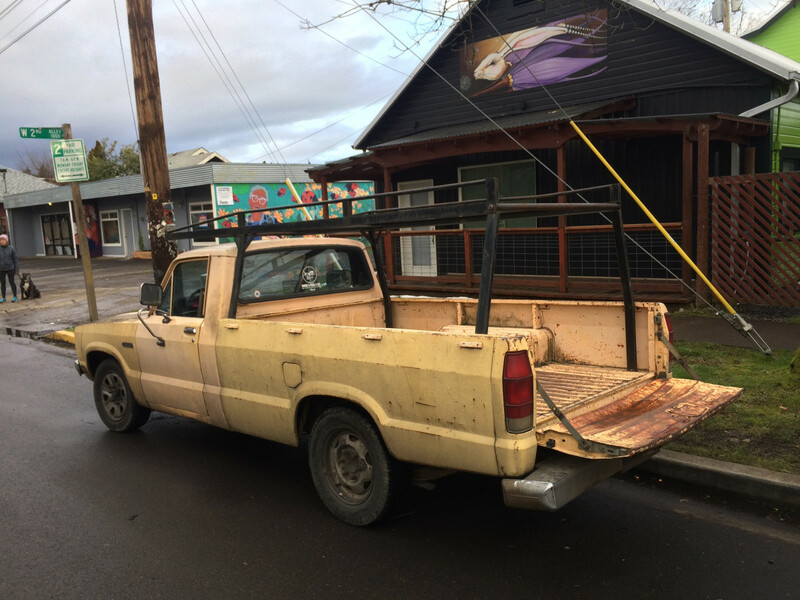 A work truck with some of the FX4 goodies and skid plates… and a manual trans. Please. When I return from my medical leave and get together a few bucks, a Bronco ll awaits me in my future. 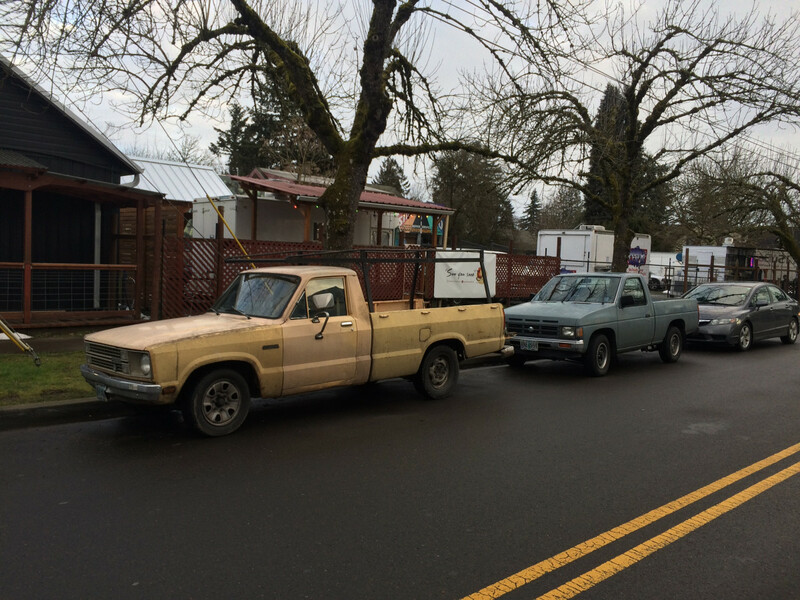 In twenty or thirty years the Eugene pickup community will have plenty of modern pre-owned Courier models to choose from. It’s currently being developed by Ford and should hit the streets by 2022. Yeah, I should have mentioned that. But I do wonder just how much utility they will have. It might not be a very direct replacement for a long bed Courier like this. But with Ford’s focus on commercial vehicles, who knows? Mini trucks….Many Mini trucks. The mid 70s to mid 80s. A number of friends owned one, Ford, Chevy, Mazda, Toyota and Datsun…yes, Datsun, Dependable and always ready. Do not remember anyone ever disliking their li’l truck. Sure. some maintenance issues cropped up. but easily contained. I admit to not ever owning one though many like the Courier above, did get my notice. In 77, Finding my Audi Fox was not the ideal vehicle for rehabbing materials for my old Edwardian home in St. Louis, I needed a second vehicle, a truck….Ah, an opportunity to have one of these cheerful little beasties…. However, A good deal on a full size Chevy C-10 long bed won. Just as dependable and more payload, plus a good vehicle for weekends at the farm in the Ozarks. Last Mini truck I had access to was my partners Mazda. Again a good truck. As for naming the era. “Mini truck” seems to be obvious and most well known. A friend of mine had one of these, an ’81. It was fairly clean when he bought it in ’92, but he was on those destroyer-of-vehicles types, and the cheapest penny pinching skinflint ever known, to boot . Kept it for 8 or 9 years, and it was a beat to hell embarrassment in it’s last days. Once, some friends of mine in Calgary reluctantly allowed it to sit in their driveway for a week, because it was cheaper to fly out of Calgary to Hawaii than Saskatoon. Apparently, they were mortified the whole time. In the end it had no, and I mean NO floor. On highway trips him and his wife would wrap themselves in blankets to stay warm in cold weather. He actually lost one of his cellphones out the bottom of the cab one time. He finally replaced it with a 3 year old ’97 Ranger. We had early and late Couriers at work, and as I said before, they were honest, reliable trucks. I liked the way they drove. They were more reliable than the S10 and Ranger trucks that followed them into my employer’s fleet. I don’t remember the ’82 having a Lima engine – maybe that was optional? I was very sorry to see the last one leave our fleet in 1995; it was identical to this featured truck. It looks like a lot of the work that formerly went to small pickups has moved to small vans like the TC. As Edward S. noted above, there’s supposed to be a new Courier pickup based on the next-gen TC. The TC has an MSRP around $23k and sells for $21k, so I predict the Courier will be selling under $20k. I think that’s why the Ranger starts at a higher price than the Colorado – to leave room for the new Courier below it. Car-based pickups have been all over South America for decades. Will they catch on in the US? Who knows? I hired a pale yellow ute the same as the featured vehicle from Avis decades ago I wanted something to tow an engine out 55 Austin Westminster home and asked for a Holden 1 tonner or Falcon ute but Avis assured me the new B1800 Mazda would do the job and they were right it was a very slow trip the trailer alone weighed around a tonne and the car on it close to the same with the engine and box 7 cwt in the pickup bed the ute sat pretty low, but I was impressed, those utes were cramped and uncomfortable but they could haul stuff. Nice to see these dependable little workhorses get their due appreciation. I’ve had a number of Rangers, Nissan Hardbodies (d21) and Toyota pickups (and Tacomas). They’re one of my favorite types of vehicle – just so handy! I never owned one of the original small pickups, but I did have a 1996 Ranger and loved it. My brother had a LUV at one point, and I recall that one being functionally similar. If you did not haul people, it was practically perfect. The biggest issue with owning a truck is that you are constantly asked to either tote items for friends or asked if they can borrow your truck. As to the car-based pickups, I know why they won’t try them here. The North American market pays premium for trucks, so why offer a cheaper, lower profit margin version if you don’t have to. That said, Hyundai seems closest to offering one soon, the Santa Cruz. If it works, I wonder who else will jump on the bandwagon? The dash design still looks more inviting and modern than the 2004 Colorado/Canyon. 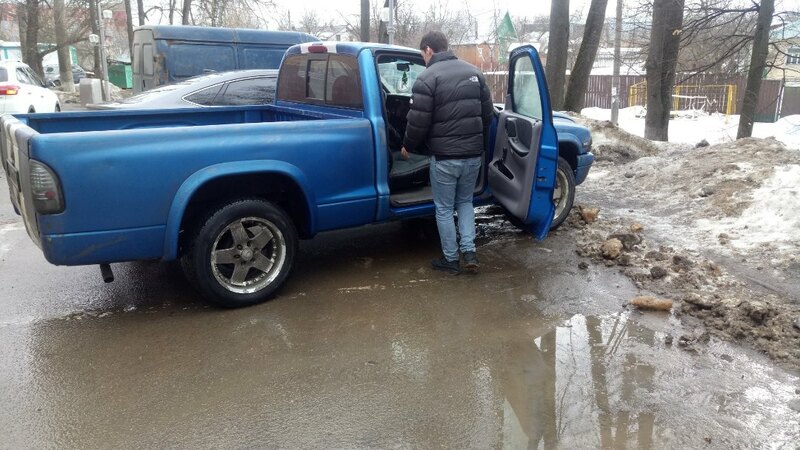 A friend of mine owns an early 2000s Dodge Dakota, which is a pretty sensibly sized and versatile truck. He is one of the very few people out here who actually use a pickup truck as it is intended to be used, that its – to carry stuff he needs for his job. Unfortunately, single cabs are Unobtainium here, everyone wants a double cab and a small, useless bed – to cover it with a plastic canopy and pretend it is actually an SUV trunk. I mean – if you’re saying they are somewhat uncommon in US today; here they are literally impossible to find most of the time (1-2 advertisements per 400 km search radius, if you’re lucky). I don’t mean Lada/VIS/Izh car-based pickups, of course – these are plentiful. What they’ll be doing in the future is using the new trucks of today as the haulers of then. Look around. I see plenty of 10-15 year old trucks slipping into their intended uses. Once a few dings, dents, and miles start accumulating, the $40k trucks start to fall in to the hands of the “unwashed masses” at a fraction of their original cost. My only wonder is how the crew cab 1/2 tons with the wimpy 5’8” beds will earn their keep? But, then again, I wondered how the mini-trucks of 20-30 years ago with that tiny 6’0” bed would work out? Turns out they worked out just fine. People adapt. Darn shame the old 8’0” long beds are getting scarce. AFAIK, every road-legal vehicle must steer the wheels “directly,” as in, there must be a physical connection between the wheels and the steering input. Off-road vehicles like tractors are not beholden to this. I still see a few these in Central Oregon, as well as the occasional LUV and lots of Toyota and Datsun/Nissan trucks. Personally I find the cab a little too small and prefer the next generation Mazda B series. These are also common along with some of the final US B series trucks which were a Courier in reverse, being restyled Ford Rangers. Around here the folks who use pickups AS TRUCKS are still using these small Couriers and Rangers and Luvs, along with older normal-size pickups from the ’70s and ’80s. The newer mutant monsters are used as cars. I would count the ’90’s as well. My 2000 K2500 is the very last of the GMT400 series, introduced for ’88. It is a regular cab, bench seat and eight foot bed. It has crank windows and no carpeting. Ideal for work or outdoor adventures. These things were/are deathtraps. People seem to love them as “simple and tough little trucks”, but they were just garbage cans on wheels. I worked with a woman from ’79-81 who drove a white shortbed Courier most of that time. She loved it. Until one night, some drunk in a ’71 Trans Am passed out and crossed over the centerline at 35MPH, and hit her headon. In an instant, she regretted ever buying the Courier. To say it folded up would be too nice, the T/A just ate it, and if the T/A hadn’t been 10 years old, it would have been back on the road as it wasn’t in all that bad of shape. She didn’t even have the good luck to pass out as the firewall collapsed and the brake pedal almost pinched off her left foot. She was totally feeling everything as they cut her out of it. Her foot was only attached by the Achille’s tendon and the artery. Somehow, they sewed it back on, and it stayed on. I think she would have been much better to have had it amputated, as it never really worked right, and later on, she did have it removed, which improved her mobility about 80% overnight. I saw a Chevy LUV fold up the same way not long after her truck was wrecked. That guy didn’t survive. His wreck was at a higher speed, about 45, and there was no way he could have survived. He lost control exiting the freeway and hit the noise wall headon. The frame just folded up and the bed wound up right behind him and the paramedics pronounced him dead before they got him out of it. I was about 100 feet behind him when he lost it, and got myself on the LA news that night describing what happened. Like so many vehicles in the Russian wreck videos, it’s not clear why on a clear dry day, he lost control like he did, and so many of them do in the videos.